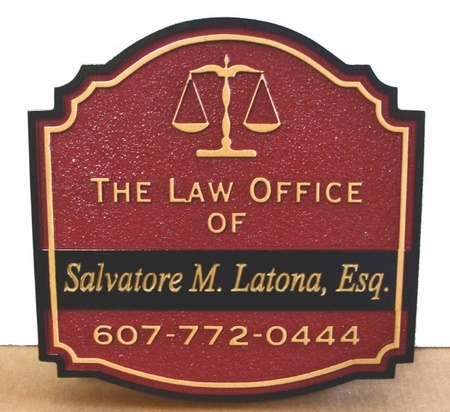 This handsome attorney sign has V-carved text for the Attorney's name on a smoooth surface, the remainder of the sign has been CNC routed followed by sandblasting. Metallic gold and imitation gold paint have been used for the text, art and border .This sign is also available in dark green and dark blue, with lighter outer border and central band. Sign width can range from 18 inches to 36 inches or larger.